Same here... I have looked everywhere for a a solution to this. Tried editing save files, and roster files but nothing works. Is inventory based on kerbal's level? That's the last thing I am checking and if it doesn't work then I have no idea how to fix it. I cannot open any containers because it says that there is a missing sound file. Please fix this or at least not require the sound for the container to be used. is it your first mod you tried to download? how do i store the wrench in a container? it wont attach to the surface of the container. kospy44 how do i put hats on kerbals? I'm unable to put any types og Labs inside the containers, even though they're supposed to be big enough. can you upload the cargo rover and more? 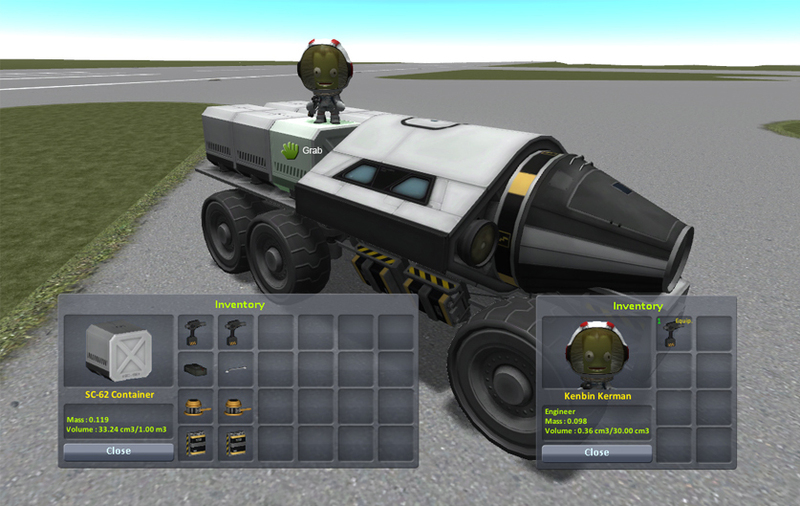 A great mod, but it doesnt work on my ksp 1.0.5 mac install. It would be great if you could make it compatible. Thanks! I cant pick up any parts and move them. It says everything is to heavy even the pips are to heavy even when i have 5 Kerbals around. Can any one help or please fix this mishap. Thank you!